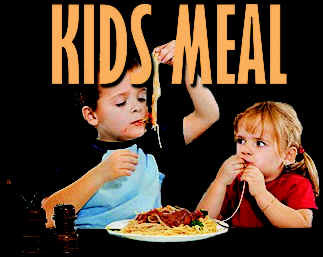 "Kids Meal" Menu Items Are Reserved For Children Dining "12-Years And Under". A classic 5oz American burger made with premium ground round beef on a toasted sesame seed bun with lettuce, tomato, onions and mayo. Served with French fries. A classic 5oz American burger made with premium ground round beef on a toasted sesame seed bun with sliced cheese, lettuce, tomato, onions and mayo. Served with French fries. Sea snapper sliced into chunky sticks, seasoned and coated with our batter recipe then deep fried. Served with French fries and our signature tartar sauce on the side. (Our Fish Fillet Is Always Deboned As Best As Possible. However Please Use Caution). Tomato based spaghetti sauce served on a bed of spaghetti pasta with parmesan cheese and parsley. Our signature creamy Alfredo parmesan cheese sauce server on a bed of linguini pasta and topped with shredded parmesan cheese and parsley.